Hands down, I’m a breakfast sausage lover and would choose it nine times out of ten over bacon. Maybe you feel the same way. 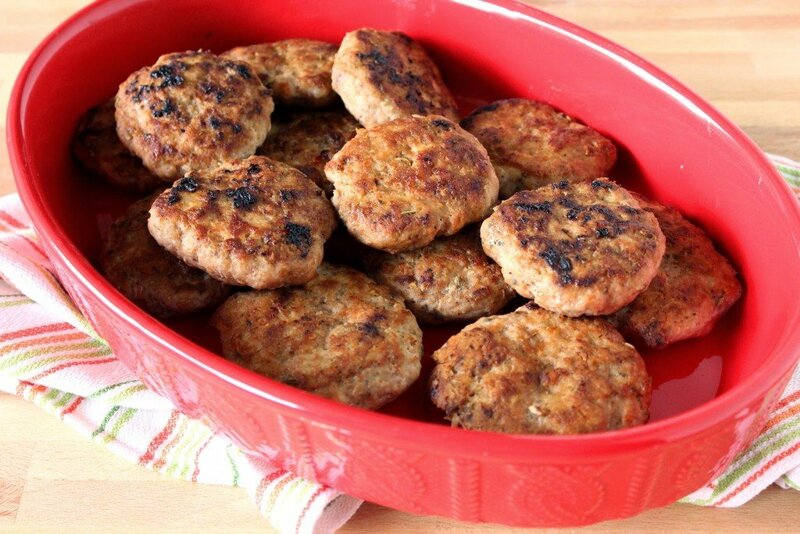 If you do, I have an awesome recipe for you today where you can get the same flavor of your favorite pork breakfast sausage, except that you make it with ground turkey that keeps the fat down and makes it a whole lot healthier for you. I promise, once you try this Homemade Turkey Sausage you’ll never miss the pork, albeit it in sausage, or bacon, form. Below is a photo of the sausage after it has been formed and cooked. I wanted you get an idea what it looks like before it went onto the muffin sandwich. As you can see I made pretty many. The reason I did is because I wanted to have plenty on hand so that I can grab one or two during the week (without the muffin and cheese, of course) for an easy, high protein, low-calorie breakfast. I figure if I have them on hand ready to heat, I’ll be less likely to grab something like a high carb bagel that will spike my blood sugar and leave me feeling hungry one hour later. These turkey sausages are super, super easy to make and you can shape them into either patties or links…whatever suits your fancy. What’s that you say? You’re worried that turkey sausages will be dry and flavorless. Not so. I’ve taken care that with a little olive oil in the mix along with some spices and seasonings such as fennel seed, red pepper flakes, ground sage and smoked paprika. When I had the idea to turn some of these sausages into egg muffins, I knew I needed a way to keep the eggs contained as they cooked so they’d fit neatly onto the sandwich without hanging over. Naturally, empty tuna cans came to mind. However, when I went to open the cans on both ends, I found it impossible because the way cans are manufactured there isn’t an edge for the can opener to grasp on the bottom of the cans….What’s a girl to do? 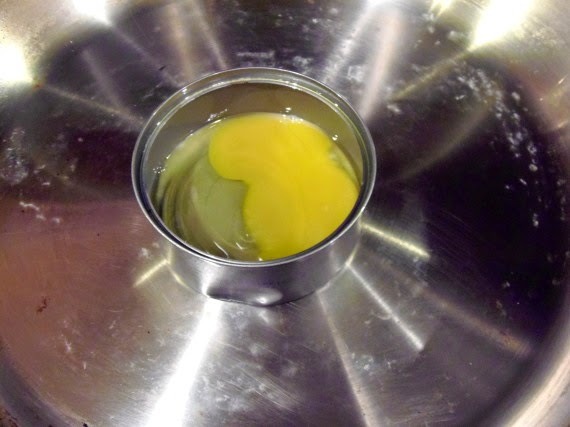 It only took a moment to realize that, because the can is metal I can still put it in a skillet with the bottom intact, and the egg should cook just as it would if the bottom of the can was open…it just might take a little longer. I sprayed the heck out of the clean tuna cans with olive oil spray and cracked one egg into each one. I seasoned each with salt and pepper and then put the cover on the skillet and crossed my fingers that they’d cook and that I could remove the eggs from the cans without much trouble. A few minutes later…complete success! Perfectly delicious, perfectly shaped hard cooked eggs came out of their cans with a simple jiggle and a pair of tongs (be careful, the cans are HOT). The quantity of ingredients I’m sharing with you today makes 12-15 three inch round sausages. If you decide that you don’t need that many sausages, this recipe is easy enough to cut in half as far a measurements go. Feel free to make as many, or as little as you need. -Place the above ingredients into a large bowl and mix well (I find that clean hands work best for this task). 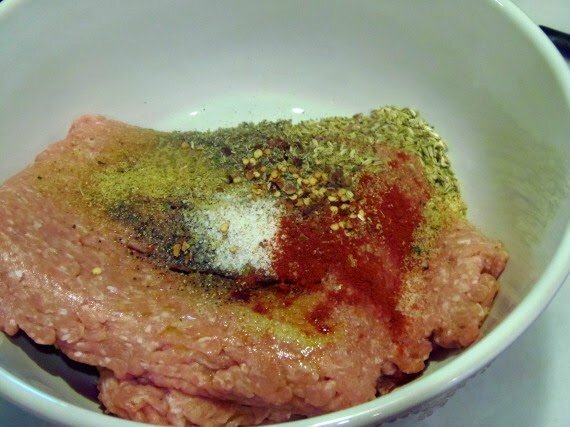 -Shape the meat mixture into 3″ patties that are approximately ½” thick. 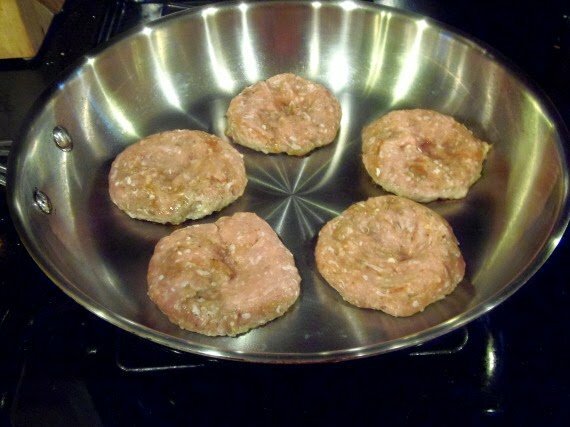 Press a well into the center of each patty with your fingers to keep the patties as flat as possible during cooking. 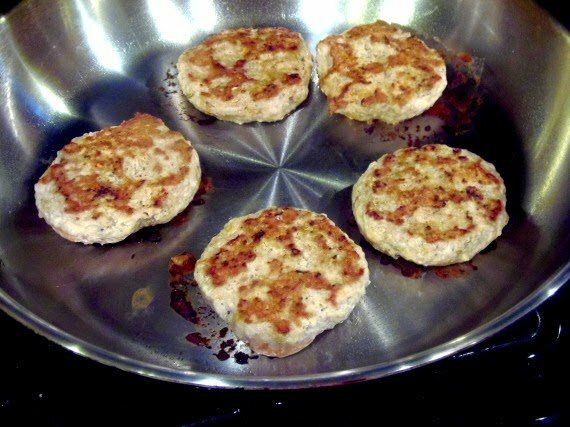 -Cook the patties in a large skillet over medium/high heat (I cooked them in a dry skillet but you can use a drizzle of olive oil if you prefer) for approximately 3-4 minutes per side, making sure they’re thoroughly cooked in the center and no pink remains. -Continue the same process with the remainder of the turkey mixture. -To make the eggs, spray the empty and clean tuna cans liberally with olive olive oil spray. Place the tuna cans into a dry skillet over medium heat. -Crack and egg into each tuna can and season each with a little salt and pepper. Cover the skillet and allow the eggs to cook for approximately 7-8 minutes or until the eggs are cooked through. 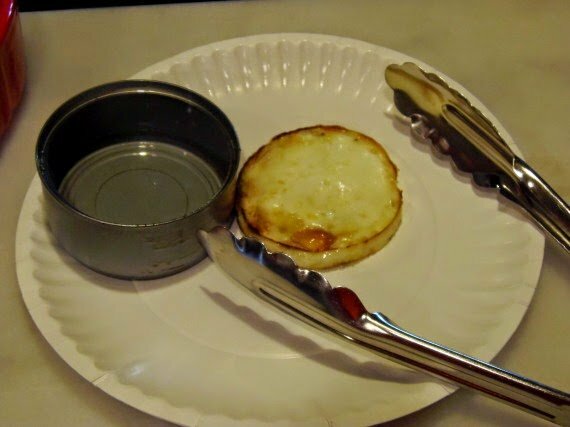 -Using tongs, carefully remove the cans from the skillet and give them a little jiggle. 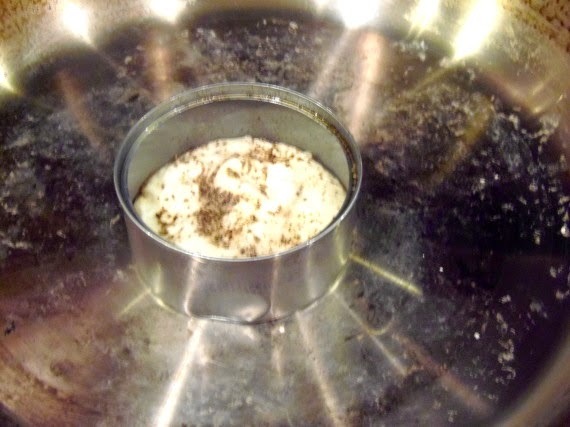 Once turned over, the eggs should slip easily out of the cans. -Assemble the sandwich by placing the egg, sausage, cheese between the top and bottom of the toasted, buttered English muffin. 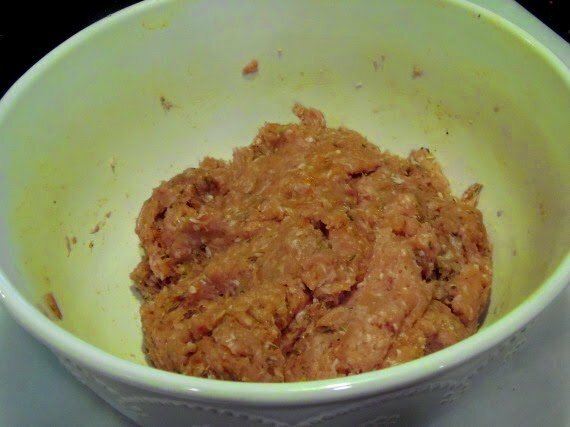 As always, here are some step-by-step photos of the process of making the turkey sausages, and the eggs in the tuna cans. I hope they’re helpful to you. Should you have any questions, please feel free to leave them for me in the comment section and I’ll be happy to answer them just as soon as possible. Mix all the turkey ingredients in a large bowl. Shape the meat mixture into 3″ circles and indent each patty with your fingers to keep them flat while cooking. Cook them each for approximately 3-4 minutes per side until no pink remains in the center. To make the sandwiches, set the sausages aside and keep warm. 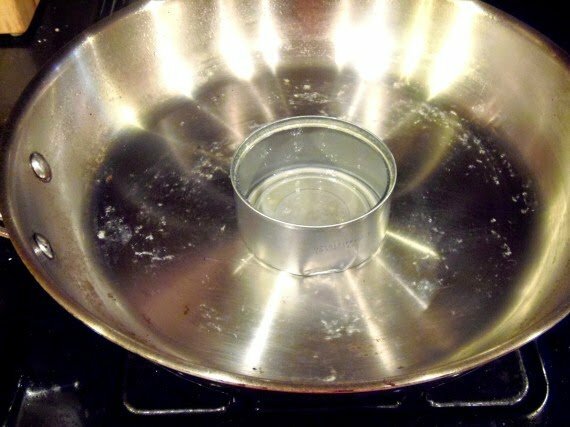 Place the tuna cans that have been liberally sprayed with olive oil in a dry skillet over medium heat. Crack an egg into each tuna can and season them with salt and pepper. Cover the skillet and allow the eggs to cook thoroughly. Once cooked, use tongs to carefully remove the cans to a plate and turn the eggs out. Assemble the sausage and egg sandwiches and serve. If there is every anything I can paint for you, please don’t hesitate to contact me or visit my shop. Custom orders are always welcome and I can work from any photo or idea you send my way. Thanks for visiting me in my Kudos Kitchen! I truly hope you’ve enjoyed your stay. 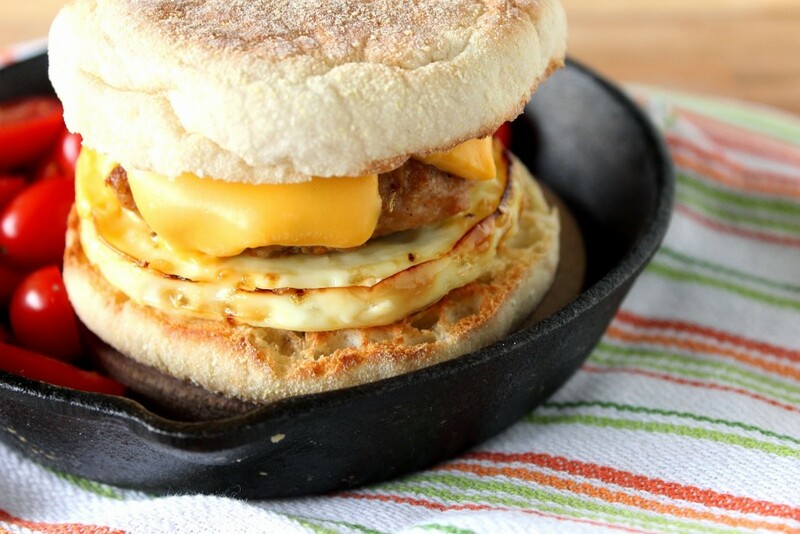 Gotta love breakfast sandwiches! It's one of my kids' favourite meals any time of day! My husband has let it slip recently that he gets a sausage breakfast sandwich every day at work! I think I should start making him these to go instead. Thanks! 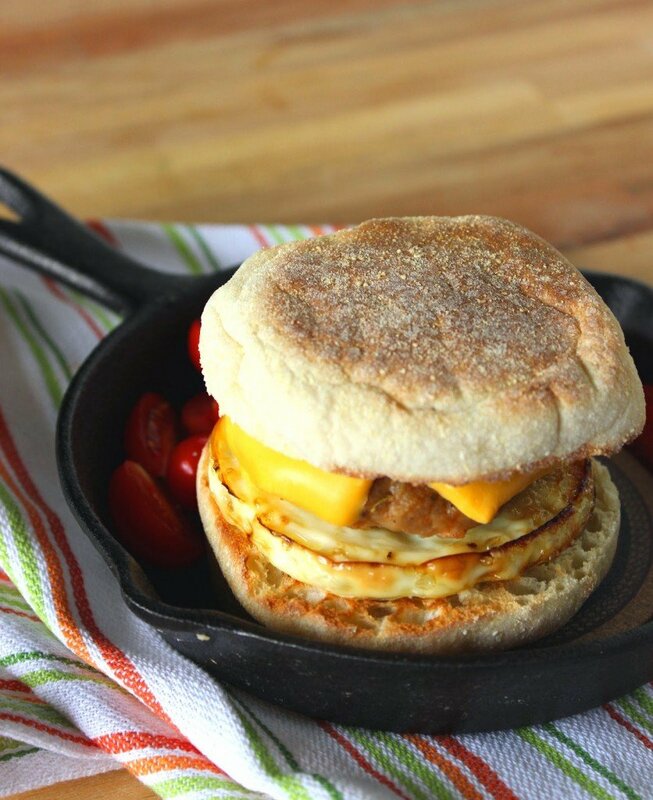 Very smart to use the tuna can to cook your eggs in for these muffin sandwiches. 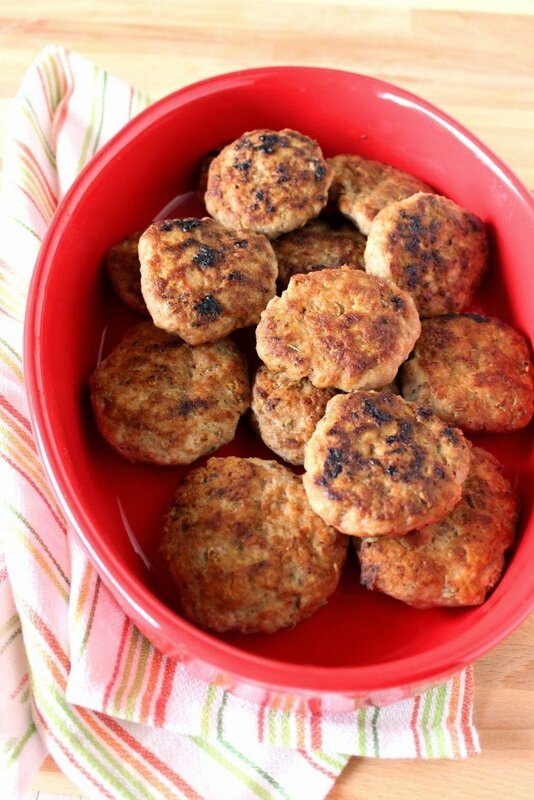 The turkey sausage is a nice change up from pork not to mention a little bit healthier too. Nice recipe Renee. Love homemade sausage, there is nothing better! Plus cooking the egg in the tuna tin is perfect! Love turkey sausage! Thanks for sharing how to make it at home! 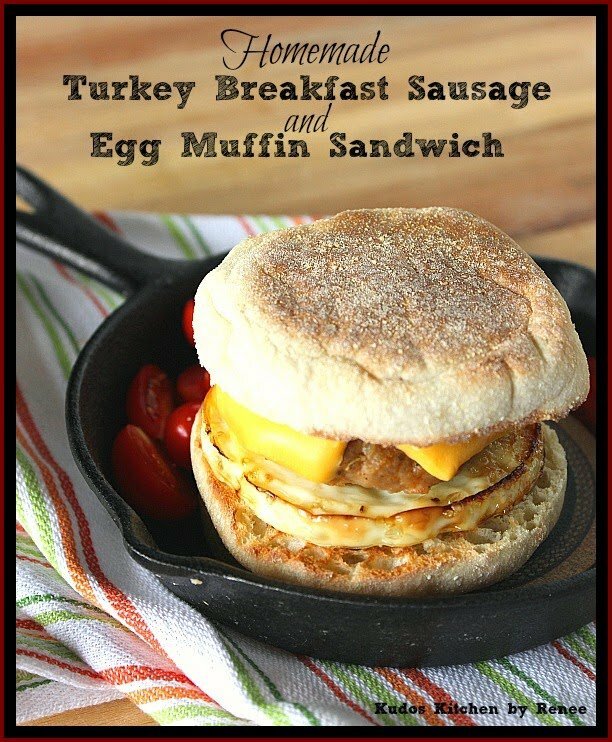 My husband will go crazy over this breakfast sandwich!! It's his favorite thing to eat. YUM! I love a breakfast sandwich! I just love breakfast sandwiches. So great for running out the door too. Love breakfast sandwiches!! I'm a bacon girl, but these sausages are about to make me a convert! I'm not going to go so far as to say that I prefer sausage over bacon – but I do love it! 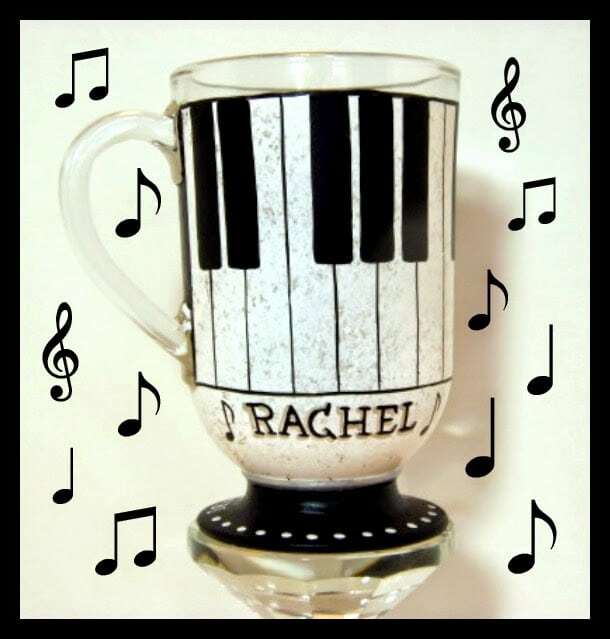 😉 This looks and sounds soooo good, Renee. 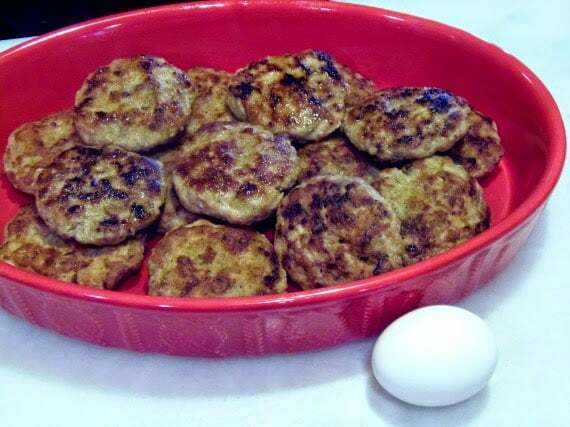 My youngest son always request a homemade egg "mc"muffin in the mornings, so I should totally make a batch of this sausage and make your muffin sammies to surprise him. What a fabulous breakfast! Looks delicious! Renee — this is the perfect breakfast sandwich. This looks fantastic – and the trick with the eggs – Maguyver better watch out! 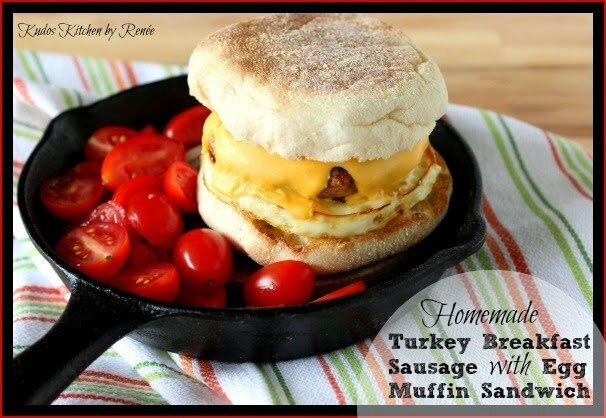 I love the breakfast sandwich and you did a fantastic job on this one with turkey sausage. I made these this morning and they were delicious!!!! Thank you!